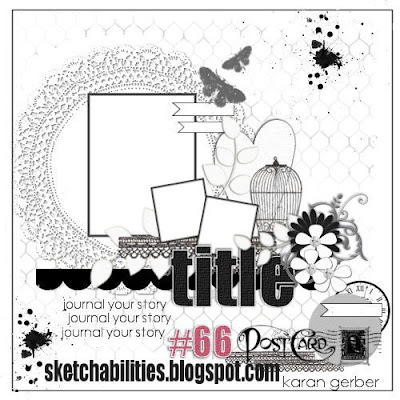 This is the sketch of the month at Sketchabilities. Great one, right? Here's my take on it. You may notice, I flipped the embellishments to the other side and the photo orientation. 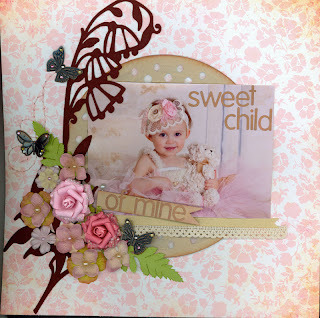 What a sweet page - love that chipboard (?) Thanks for playing at Sketchabilities! Awesome layout! LOVE the title. I listened to that song when I was pregnant with my first. The photo is adorable. 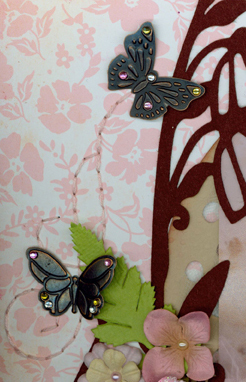 I LOVE the clusster of embellishments. Great JOB!! Thanks for playing along with us at Sketchabilities! The chipboard you're talking about must be the Prima felt flourish?? I love them too. They come in a pack of three and I always use the back (which peels off, because they're stickers) for a mask later. Great bang for your buck!